LL and I tried out Zombicide from Guillotine Games tonight. In the game, you take the role of one of six survivors facing down a zombie horde as you attempt to accomplish certain objectives. It’s very well done, with great components including nine map tiles and various tokens printed on thick cardboard and 71 nicely sculpted 32mm miniature figures. There are six survivors to choose from and each has special features that make them unique. 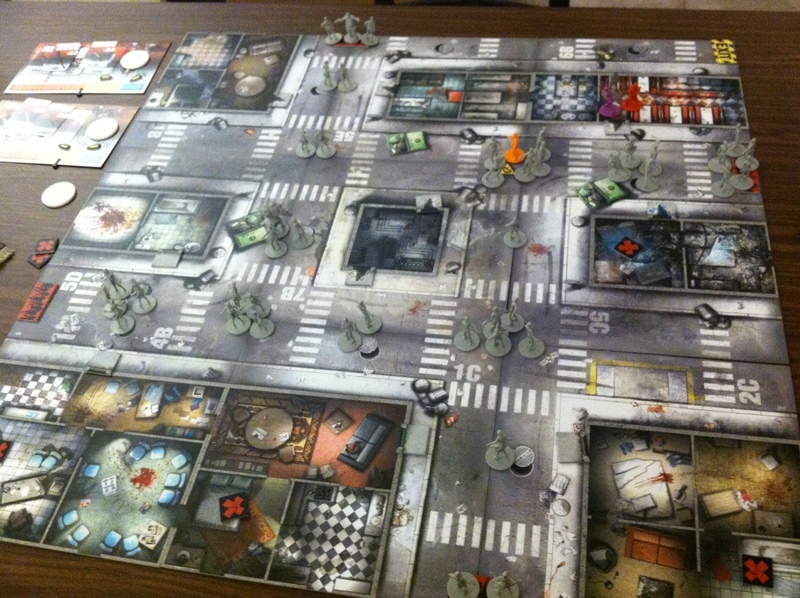 Zombicide has some unique gameplay features. The play sequence has the survivor characters acting first, followed by the zombies. On their phase, the survivors can each take three actions (more if they have special abilities allowing it or have gained some experience). They can move from one “zone” to another, attack a zombie, search a room or vehicle, open a door, and more. As survivors kill zombies and accomplish objectives, they gain experience. As a survivor’s experience grows, so does the danger level of the game. Survivors start out at the “blue” danger level but move quickly to “yellow” as they reach seven experience points. It takes a bit longer to get to “orange” and a bit more to get to “red”. At each level, they gain new abilities: an extra action at yellow, and selectable skills differing for each survivor at each of the other levels. What does the danger level mean? New zombies enter the board at “spawn points” at the end of each turn and are placed in revealed rooms after doors are opened. 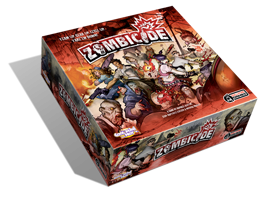 To determine how many and which type of zombies appear at a given point, the players draw from a deck of cards and read the results shown. At blue level the usual result is one or two normal zombies and sometimes nothing. At yellow and higher, however, things get a little tougher, introducing larger groups of zombies, “runners” (two attacks and moves each turn), “fatties” (tougher to kill and accompanied by two “walkers”), and (heaven forbid) the “abomination” (a scary fatty that’s very hard to take down). The game starts out slowly but ramps up quickly: once the first survivor reaches seven points of experience, the danger level goes to yellow…for everybody. Zombies are drawn toward any survivors they can see or to the noisiest spot on the map. Actions like shooting a gun or bashing down a door with an axe generate a “noise token” in that zone. Additionally, each survivor counts as a noise token in the square he or she occupies. This sounds bad but can be used to your advantage: put your badass zombie killers somewhere and start up chainsaws and such while your stealthy roller-skating waitress survivor goes around and opens doors with a crowbar (silent). Nobody said zombies were smart. Each weapon card tells you how many dice you can roll with each attack, the number needed to hit, and the number of wounds caused by the weapon. It also shows you whether it can be dual-wielded…if you have two of the same weapon you can use both in the same attack, giving you more dice to roll. Melee weapons are only useful against zombies in your zone. Ranged weapons might reach out as far as three zones. The extra twist on ranged weapons is that you’re pretty much going to kill survivors in whatever zone you shoot into…so only shoot into squares containing only zombies. Walkers and runners take one point of damage to destroy. A fatty takes two. The abomination takes three…which means you need some major firepower (like a Molotov cocktail) to kill him. The game was pretty fun and easy to play and I think we’re both looking forward to trying it again. I understand that Guillotine is working up a new add-on featuring a mall, six new survivors, and zombie versions of the old and new survivors. Now that sounds like fun!